The Cuaba Salomon is a massive and complex full bodied Double Perfecto, 7.2” (184mm) long, of 57 ring gauge, and comes in a 10 cigars box. The Cuaba Salomon is rich and complex right from the beginning and all along the smoke. 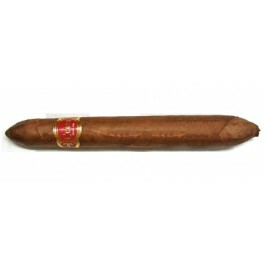 • This behemoth figurado is packed with rich earthy and woody aromas. • The draw is always excellent. If stored properly, aging is limitless. Excellent in all ways, beautiful to behold, nice construction, and most importantly, the flavors are fantastic. This double figurado is beautiful to look at. Perfect wrapper and color. The construction of this beauty is an art unto itself. Aromas of tobacco, leather & some spice. Burn is even throughout and the draw is a little firm but opens up about midway. Starts with light flavors of rich velvety dark cherries, vanilla and caramel. Lets loose with flavors of cocoa, more vanilla and a creamy sweetness. Burns slowly and smoothly. More dark cherries hit the palate. The best part starts with the final third with spice, leather and cream all in a homogenous blend of complexity. Full and rich, never harsh. Mouth-filling, and lush. To summarize, this is an excellent cigar for any special occasion where time is of no consequence and the occasion is truly special.